The most recent figures released by the FBI show that throughout the country, the rates for violent crime and property crime have gone down 6.6% and 4.7% respectively. Even so, that doesn’t mean the need for good police officers have gone down. Quite the reverse is happening actually, because jobs in law enforcement have become more in demand as police departments throughout the country want to keep the crime rates low, or even lower. What this means is that there are now job opportunities for those able bodied men and women who can meet the requirements and responsibilities of being a police officer. There was a time when your job search was limited to the area you were living in, but now the Internet has made it possible for you to find a job as a police officer anywhere in the US. Police Employment is one of the more popular job hunting sites for aspiring police officers today as it provides a wide array of career options and opportunities. The website offers a job board that you can search by keyword, and you can also look up police departments hiring people in entry level positions, supervisory jobs and more. In fact among the most in demand positions right now on the site are for forensic science and crime scene investigators. In addition, the site has several job listings by state so you can refine your search by city, state, county, local, state or federal. There are also additional options on the site so you can search by experience level, experience type and relevance as well. The Blue Line is another website that is dedicated to providing job opportunities for aspiring police officers throughout the country. Aside from Federal law enforcement jobs the website also lists job openings for civilian and sworn law enforcers as well as openings in consulting and private security firms. When you visit the site you’ll see lists of available job openings such as police detective, paramedics, firefighter and so on. Just click on the opening you’re interested in and a full description will appear complete with the location, website, contact number, starting salary and other pertinent information. The job requirements will also be listed. If you are interested in the job and meet the requirement, go to the website provided or use the contact number given. From there it’s just a matter of filling and following up the application process. Indeed is comprehensive job site, and while not solely dedicated to police officer employment opportunities, offers a wide range of options. Unlike other job search sites online, Indeed checks out advertisements from several job boards online so you get to choose from as many possible. In addition, the website allows you to search by keyword, salary and location, so it is a good option if you’re looking for police jobs in Florida or other cities or states. Furthermore, the website is also a good resource if you’re also looking for job openings in criminology or criminal justice. The websites above will all provide links to various job openings for police officers all over America. However, that’s only one part of the process as you need to complete the job application. Even if you meet the requirements, a poorly composed job application form will still result in rejection. 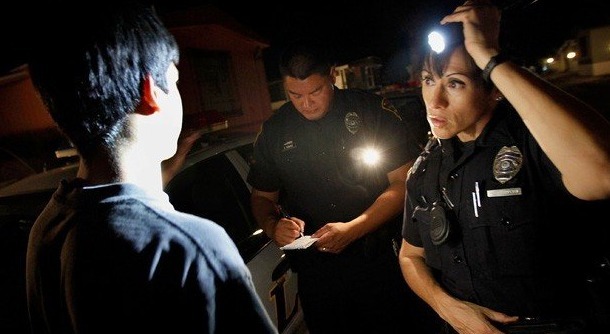 You need to understand that law enforcement agencies have an objective hiring process and anyone who meets those requirements will likely get hired, but it’s up to you to fill up that job application properly and articulate that you have what it takes to be a cop. Be certain your application is readable, intelligible and up to date. Follow all the instructions and requirements. While the requirements in most states are similar, there are some differences here and there which an applicant like you has to be aware of. Applying for a police job online is not really that different from traditional application methods. You may fill up some forms online but the time will come when you’ll have to go to the police academy and be interviewed. Also keep in mind that your job application is the first means of contact between you and law enforcement agency, so you need to create a good impression. When you file a job application, it becomes an extension of you and says a lot about your personality, discipline, professionalism and if you represent the ideals of the agency you are applying for. That’s the reason why it’s so important to read the directions because it is tempting to just go through the motions if you have been applying at different positions. This point cannot be stressed enough because if you cannot follow the simple instructions in a job application form, what more taking orders from your superiors when you’re on duty? It’s also essential that you articulate and emphasize the experience you have since that will count for a lot. If you are looking for police jobs in Indiana for instance, make sure you mention any experience you had with the military, your educational background, and so on. Frequently, the standards are mandated by the state POST or the state’s training and standards commission. If for instance the job requires a 2 year working experience, then make sure that point is emphasized in your application.